Back in 2008, Pixelache produced Vihreä Pilvi / Nuage Vert, a temporary environmental installation created by the collective HeHe in Helsinki. By illuminating the vapour cloud of the electrical power plant in Ruoholahti with a green laser, HeHe both made the visible and the invisible visible, asking questions and engaging in a dialogue about our energy consumption and about our relation to the site of production of our energy. From the first idea to the realisation in 2008, it took 5 years, a long process…HeHe have tried to realise Nuage Vert in Paris since 2008 without success. Or perhaps it would be more exact to say, with a very different kind of success, consisting in generating a huge public discussion, which certainly didn't happen in Helsinki ... in the same way. The two sites they considered for the project in Paris were the recycling plant of Ivry-sur-Seine and the recycling plant of Saint Ouen, respectively in the south and in the north of the French capital. In 2009, after long discussions involving the municipality, local associations, politicians and more, the municipality of Ivry and the Syctom (organization that administrates both sites) refused to give the artists the authorization to realise the project. HeHe decided to make a pirate projection during one night in November 2010, which was of course not very appreciated by the local authorities. In Saint Ouen, the artists also initiated a very long and interesting process of negotiation and discussion involving various organizations and people, but Nuage Vert was never seen in the sky of Saint Ouen. Last Saturday (6.10), Paris' annual 'Nuit Blanche' took place. 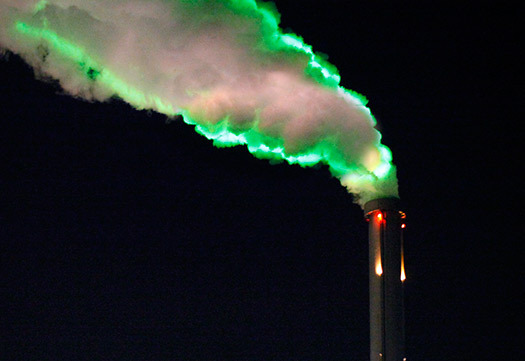 And on that night, the chimney plume of the recycling plant of Ivry-sur-Seine turned pink. An authorised spectacular projection by artist Jacqueline Dauriac. Shocker. 'As compared with the green 'without authorization' of 2010, pink within a major cultural event will probably appease everyone and won't raise any questions. Positive, at ease with the language of communication and in conformity with the cultural industry, pink doesn't risk anything' write HeHe on the French blog of Nuage Vert. Pink plumes or Green clouds?